There are so many benefits to going vegan. First off, it’s said that going vegan can drastically improve the environment. It conserves water as livestock guzzles more freshwater than just about anything else; it reduces energy consumption; and it can even purify the air as livestock causes more air pollution than any mode of transportation in the world combined. A vegan diet has also been linked to a lower risk in cancer, improved bone and heart health, lower mortality rates, and lowers blood sugar levels. 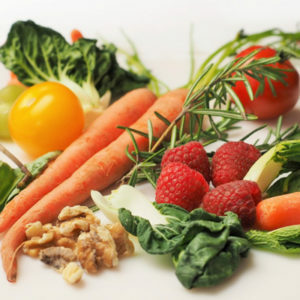 Several studies have reported that vegan diets typically provide more fiber and antioxidants. They also appear to be richer in potassium, magnesium, and vitamins, according to Healthline. As many of us are familiar with, going alkaline has numerous benefits as well. An acidic body is said to cause depression, fatigue, skin problems, hormonal imbalances, digestion issues, and more. That’s why the alkaline diet has become so popular in recent years. Reaching a more alkaline state can help improve your overall health and is said to even help with weight loss and your immune system. The biggest concern when people debate going on an alkaline-friendly diet is if they can continue to eat meat. It’s true that meat, poultry, eggs, and fish are very acidic to your body. They also cause other health problems. For example, red meat has been linked to an increased risk of heart disease, diabetes, and cancer. But the answer is yes. If you are against going vegan and you’d like to try an alkaline diet, just make sure the meat is the best quality you can find. This means going organic, grass-fed, free-range, and hormone free, according to Live Energized. For those worried about getting enough protein, there are many great sources of vegan protein. These can include oats, beans, tofu, chia, seeds, and green veggies like spinach. For those of us who have decided to try a vegan or vegetarian diet, the first few months can be difficult. Last year, researchers concluded that it takes 66 days to form a single healthy habit. At first, it may seem easy to go vegan, but in actuality, many foods contain animal products. Some of these foods include: Jell-O, candy, marshmallows, many breads, and sometimes refined sugar. To combat your cravings and help you stay vegan, try meal-prepping, find like-minded people, call the restaurant ahead of time, and remind yourself why you went vegan in the first place. Also make sure you are getting all the nutrients you need. Try pHion’s Green Superfood, which contains the nutrient equivalent of more than one pound of veggies. It’s delicious in flavor and contains 30 alkalizing ingredients. Going vegan or vegetarian is a choice. There are many benefits to eating meat. It’s a great source of protein, vitamins and minerals. But there are also many negatives. Do your research, consult your nutritionist/physician and see what the best option is for you. Try simply cutting down on meats. You may find that it helps you live a healthier and happier lifestyle.